On September 25, 2017, SE PLANT 410 CA hosted the official ceremony of handing over the overhauled and upgraded BAF AN-32 aircraft to the Customer and the crew. The ceremony was attended by Volodymyr Korobov, SC Ukroboronprom assistant director general in charge of aircraft engineering and manufacturing, Yarema Zhuhaevych, the chairman of the Trade Union of Aviation Industry Workers of Ukraine, Volodymyr Yaroshenko, a representative of Flitе Industries Pte Ltd. company in Ukraine, Mahbub Ahmet, a BAF wing commander, BAF officers, SE Plant 410 CA employees and the press. 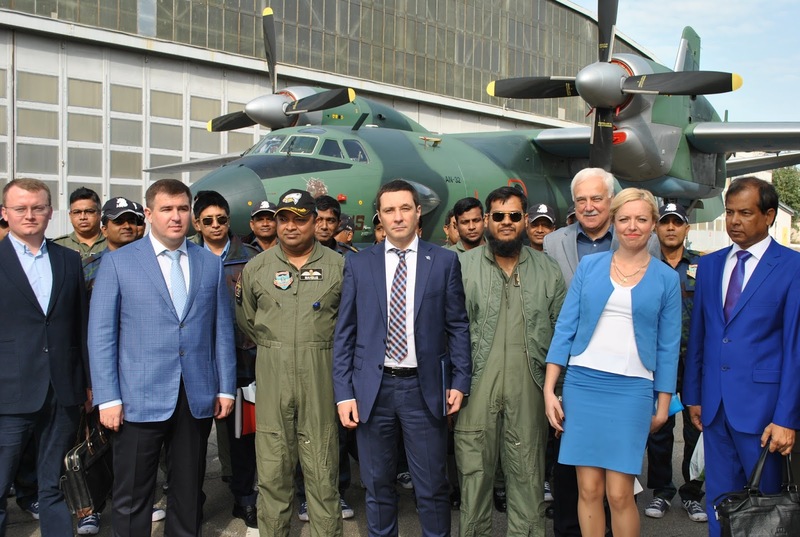 SE PLANT 410 CA Director General Viktor Gankevych highlighted the importance of Flitе Industries Pte Ltd AN-32 aircraft modification project to the Ministry of Defense of the People’s Republic of Bangladesh. He thanked the SC Ukroboronprom representative, the Customer and the crew for fruitful cooperation, and highly appraised coordinated and professional work of plant specialists while overhauling the AN-32 aircraft. “SE PLANT 410 CA had customized the AN-32 aircraft overhaul and modification, conducted successful test and control flights proving its airworthiness,” Gankevych noted. In his turn, Wing Commander Mahbub Ahmet stressed that BAF felt honored to implement the Flitе Industries Pte Ltd project with SE Plant 410 CA within the framework of the long-lasting cooperation between BAF and SE PLANT 410 CA established in 1971 when Bangladesh had gained its independence. “The aircraft had flown a long distance of 6,000 km crossing three continents and seven countries to land at SE PLANT 410 CA. I am grateful to SE PLANT 410 CA for well-done overhaul and modernization,” he said. Director General V. Gankevych awarded Mahbub Ahmet with the certificate of overhauled aircraft and an AN-32 replica. Soon after the ceremony, the AN-32 crew got busy with ferry flight preparations.